Ryan Castle is a historian and the Executive Director of ISHAR Online. When collaborative editing devolves into mob mentality it is not just the individual being abused who suffers, it is everyone who trusts in the integrity of Wikipedia. I am a director of ISHARonline.org, a Chopra Foundation Initiative, but the views expressed here are entirely my own, inspired by my own long experience as a Wikipedia editor and my concern over its integrity. Wikipedia is one of the great success stories of the Information Age: a free, open-source encyclopedia with over 37 million articles in 250 languages, all compiled by anonymous volunteer editors. There are no managers, no pay, and anyone can be an editor. It is one of the first results on any search engine and is the most common source of information for anyone first learning about a topic. These topics are generally objective and educational, and Wikipedia reports that its reliability rating approaches the Encyclopedia Britannica. While systemic bias admittedly exists on Wikipedia, it is supposedly limited to a few minor articles. However, what happens when one of those articles is about you? Deepak Chopra, M.D. is an unlikely candidate for a "minor" article, being a famous figure in health, mind-body wellness, and consciousness studies, as well as the author of more than 80 books, including 22 New York Times bestsellers. His medical training is in internal medicine and endocrinology, and he is a Fellow of the American College of Physicians, a member of the American Association of Clinical Endocrinologists, and an adjunct professor of Executive Programs at the Kellogg School of Management at Northwestern University. He is also an adjunct professor at Columbia Business School, Columbia University, and a Senior Scientist at the Gallup organization. For more than a decade, he has participated as a lecturer at the Update in Internal Medicine, an annual event sponsored by Harvard Medical School's Department of Continuing Education and the Department of Medicine, Beth Israel Deaconess Medical Center. Or, as his Wikipedia biography proclaims: Deepak Chopra is despised by all scientists as a dangerous fraud who sells false hope and spouts gibberish. Behind this radical contrast lies the online battle between those who want to publish a neutral perspective and those who want to publish their own perspective. For several years Deepak Chopra's Wikipedia biography page has been one of the front lines in that battle, with results that are damaging to both the man and the organization maligning him. In order to decide what they can trust on the mostly objective and accurate Wikipedia, the public must know the full story behind its most egregious failures. Menas Kafatos, PhD, Fletcher Jones Endowed Professor of Computational Physics, at Chapman University. The body of editors who are dominating Deepak Chopra's biography page are a dozen or so skeptics* who are so extreme in their views that they resort to online activism, many of whom consider the concept of spirituality or a mind-body connection to be a threat to human intelligence. They consider Deepak Chopra to be the embodiment of these concepts and so treat his biography as an opportunity to explain how foolish and dangerous his beliefs are. These editors are no more empowered than any other volunteer editor, but their ideological zeal and willingness to viciously attack any opposing editor has driven off most impartial editors. After all, Wikipedia is 100% volunteer, so why would someone voluntarily spend their time being called a moron and facing endless opposition to every neutral edit? There is no one to report to, as a collaborative platform Wikipedia has no formal management structure, even when collaboration turns into mob mentality. The fact that an innocent man's character is being assassinated is apparently irrelevant to these skeptic editors. He is famous, after all, and therefore not truly human. A consequence these editors may not be aware of is that their misinformation is endangering vital mental health research grants for international projects Dr. Chopra is involved in. Online claims of medical and scientific fraud can cause very real fear and endanger programs that can treat people. Wikipedia commands such trust worldwide that abuses of it have global ripples. Through determined manipulation of Wikipedia policies and abuse of other editors, these skeptics have practically locked out any dissenting opinion on the article. As part of their virtual crusade, they have called for the harassment and banning of anyone on Wikipedia who speaks out in defense of Dr. Chopra's biography. Rather than lying outright, which could be quickly refuted, they only include the facts that support their position and use a number of tactics to make their bias a reality. I'd be just as happy to not have article about Deepak Chopra or any form of pseudoscience. In fact, the vast majority of coverage about Dr. Chopra is positive. Out of the top 100 results of a Google News search on Deepak Chopra, just five news articles contained any mention of controversy or negative coverage. Presenting the bottom 5% as the only perspective that determines his notability while ignoring the other 95% is both unethical and actively misleads the public. 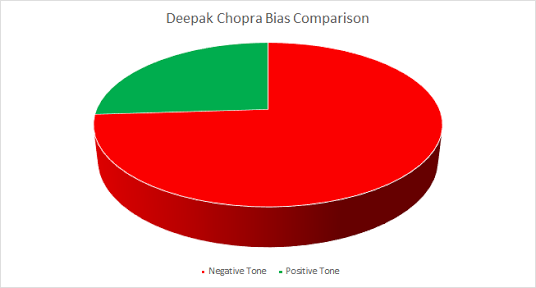 The most visible of the approaches used by the activist editors is to ensure that anywhere a viewer looks on Deepak Chopra's biography, they will find negative information. Other than the small sections about his youth, every single section of Deepak Chopra's biography includes negative coverage about him, often as the only details worth listing. Below are a few examples, though practically his entire biography could be listed. The most offensive example is that Dr. Chopra's Select Bibliography, a normally dry chart of data, rants about his books as "blather" and argues that they should be "segregated" if not "burned." You read that correctly, Wikipedia's bibliography on Deepak Chopra officially laments that his books cannot be burned. Yoga is a topic Deepak Chopra has spoken on extensively, yet the only mention it receives is a comment about a Hindu nationalist's complaint that Dr. Chopra was not "Hindu enough." Virtually every approach Dr. Chopra supports is described as being completely devoid of scientific evidence, even when there are literally thousands of medical studies that provide that very evidence. , recycling the same negative statements is a manipulative trick to make criticism appear more prevalent than it is. There are efforts to remove any mention of Dr. Chopra's medical degree and research credentials, despite government databases confirming both facts. This amounts to direct deception through omission. The introduction to the biography lists the "fact" that Deepak Chopra endangers the lives of his patients and encourages them to reject life-saving medicine. There are absolutely no sources that show this and many sources from Dr. Chopra himself that plainly disprove it, yet it is kept simply because the skeptic activists personally disagree with integrative medicine. The kind of neutral, informative news pieces that make up the rest of Wikipedia are nearly absent from Deepak Chopra's page, as they are rejected for presenting too positive a view of the subject. Wikipedia biographies are intended to provide neutral, accurate information on the person being discussed, not assassinate their character in service of an ideological agenda. Whether there is controversy behind a given figure or not, that controversy does not define their entire existence. An example of a truly controversial medical figure is Dr. Jack Kevorkian, who was convicted of murder for his role in doctor-assisted suicides. Yet despite the vastly greater body of negative coverage, Dr. Kevorkian's Wikipedia biography is actually more neutrally written than Dr. Chopra's. 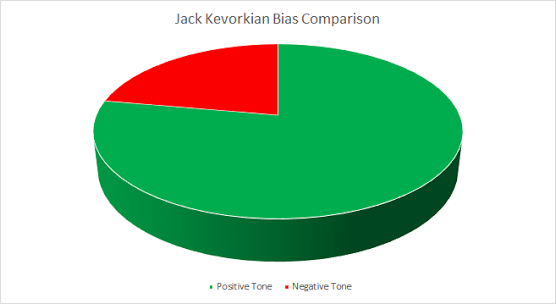 In the chart below, the green represents neutral and positive references on Jack Kevorkian's Wikipedia biography, while the red represents openly negative references. The chart below represents exactly the same thing for Deepak Chopra's biography. Dr. Chopra has 14 times the number of negative references as one of the most controversial figures in American history. Dr. Jack Kevorkian's page is an example of Wikipedia as its finest, Dr. Deepak Chopra's page is an example of Wikipedia at its worst. Abusing an open-source biography to silence a point of view does a disservice to both the maligned individual and Wikipedia as a whole. Tolerating such bias and vitriol erodes the integrity of a website whose core values include neutrality, respect and civility. Wikipedia is free for all to edit and get involved in, so the power to fix it lies with everyone. The skeptic editors can succeed in silencing a handful of opponents, but their tactics cannot survive under the light of public opinion. Whether on Wikipedia Talk pages, blogs, news articles or social media, spreading the word about the pockets of corruption on Wikipedia can help stop it from spreading to the rest of the site. There is no single leader of Wikipedia, so it is up to the public to reject misinformation, enforce integrity and hold accountable those who would abuse the trust Wikipedia commands in the Information Age. There is no one else who can safeguard the world's most influential database. If Wikipedia allows articles like Deepak Chopra's to devolve into a partisan battleground of opinions rather than information, its 37 million other articles may soon be facing a systematic distrust that would be truly tragic. *While the term "skeptic" is referenced due to common usage, true skepticism is a healthy tradition of doubting everything while also being open to evidence. It is the latter attribute these editors lack, and so a more appropriate term would be "orthodox" editors, connoting their rigid adherence to an unchanging ideology.